From a manufacturer that typically focuses on “beast mode” I wouldn’t necessarily expect too much nootropic action. 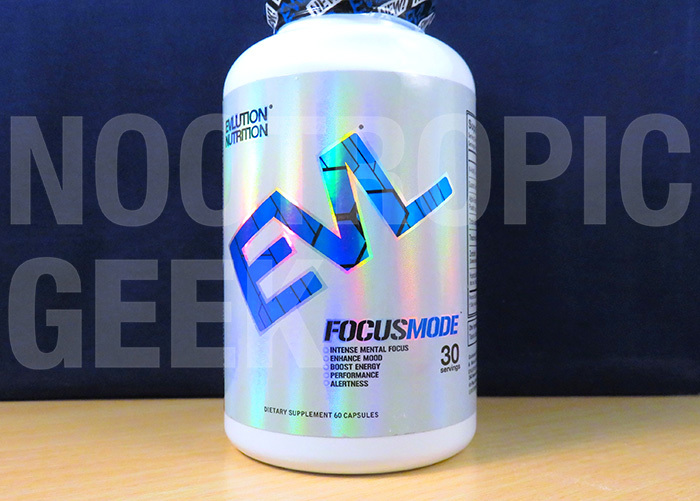 To critics like me, EVLUTION says f*** that and gives us FocusMode, which is essentially Beast Mode for the Brain. In this way, a bridge is being built between the bros & the geeks (as if the two are all that exclusive). FocusMode triggers mental power that aids both exam day & leg day. It reduces the stress of all-night essays & overworked glutes. Or at least that’s the intention of FocusMode. Let’s hit the review to see how it delivers. 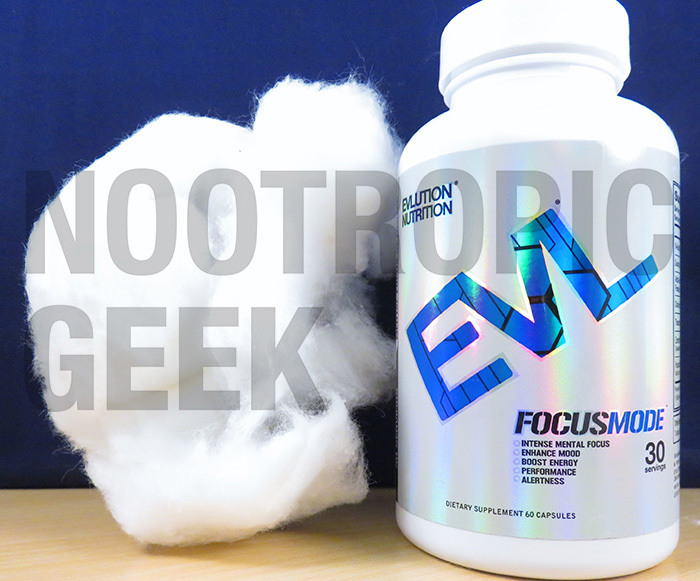 EVLUTION Nutrition branches slightly outside of “bro” territory with FocusMode, a nootropic stack geared towards both the bros & the geeks. The primary ingredient N-Acetyl L-Tyrosine is prime for reducing in-the-moment stress for increased levels of focus when it matters most. 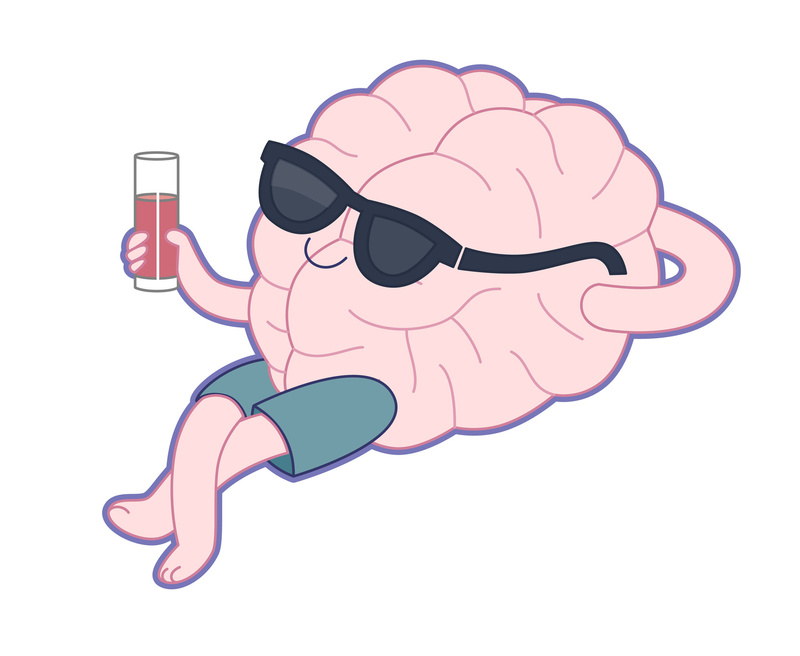 Alpha-GPC & Hup-A support memory-related brain chemicals, which, like, help the brain learn stuff better or something. Directions: As a dietary supplement, consume 1 serving (2 capsules) daily with a glass of water. For best use, take after breakfast in the morning. To avoid sleeplessness, do not take within 4 hours of sleep. The size of the cotton in EVL Focusmode was so silly I just had to take a pic. Use a smaller bottle, guys! N-Acetyl L-Tyrosine – When the mind is stressed, it burns Tyrosine. 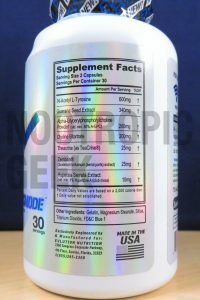 Supplementing L-Tyrosine may help alleviate the stress of stressful conditions, especially if you’re supplementing high quality N-Acetyl L-Tyrosine form. More on L-Tyrosine. Guarana Seed Extract – Contains natural guaranine, a chemical similar to caffeine in both form & function. For all intents & purposes, guaranine is caffeine (the only difference being that it’s caffeine sourced from guarana). More on Guarana. A-Glycerylphosphorylcholine Powder (std. min. 50% A-GPC) – Alpha-GPC is a quality nootropic source of choline for its ability to cross the blood-brain barrier, unlike inferior sources of choline (like the next ingredient). More on Alpha GPC. Choline Bitartrate – This is an inferior source of choline for its inability to cross the blood-brain barrier. Not that it’s a bad ingredient, but I liken the results of choline bitartrate to those of eggs, which are a natural source of choline (but much better for you than choline bitartrate). More on Choline Sources. Theacrine (as TeaCrine®) – Another compound structurally similar to caffeine. Acts as a stimulant, yet doubles as a sedative when supplemented in low-to-mild dosages. Caffeine is also believed to have sedative effects at low doses, but theacrine’s sedation come at even higher doses. Zembrin® (Sceletium tortuosum (aerial parts) extract) – Interesting ingredient. I don’t see a lot of this, despite its mood-boosting potential & well-demonstrated anxiolytic effects. Huperzia Serrata Extract (std. min. 1% Huperzine A) (club moss) – Why not throw in a little Hup-A? This nootropic packs a powerful, potent punch in such small dosages and demonstrates a decent amount of synergy with Alpha-GPC by reducing inhibition of neurotransmitter acetylcholine, the byproduct of Alpha-GPC supplementation. More on Huperzine A.
EVLUTION Nutrition stacks up supplements for the bros. Which is why I’m a little surprised to see them treading into nootropic geek territory. Yet, the manufacturers haven’t lost their identity with FocusMode as the stack seems to support both gym-time & library-time behavior. It’s a mental edge sharpener that enhances memory & mood, while pumping up the energy. It supports academic & work-related cognitive functions with Alpha-GPC + Hup-A, while taking care of the here-and-now issues with focus, stress, & energy. And the energy is multi-angled, coming from guaranine + caffeine + theacrine, which is groovy, but there’s one issue I have with it: It’s not nootropic energy. The bro brain soaking up that L-Tyrosine. This would be a prime formula to add L-Theanine, a calming, focus enhancing amino that complements jittery stimulants such as caffeine by reducing the attention-reducing jitter. 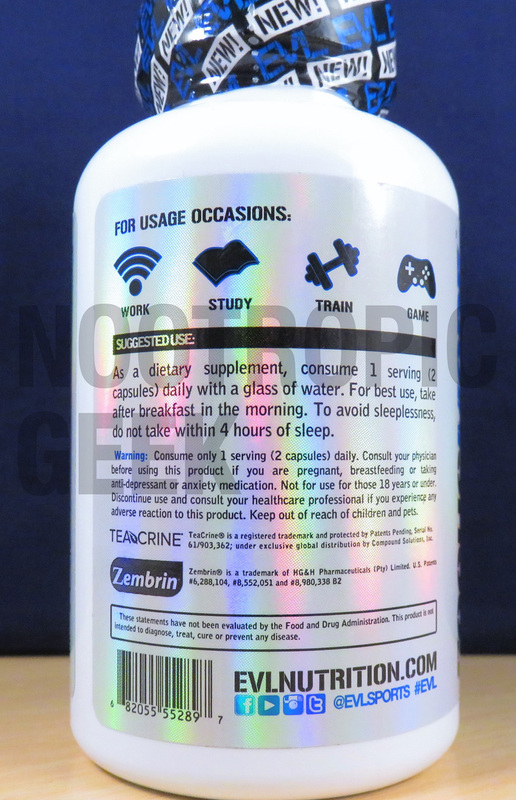 Perhaps the Zembrin may help in this department, but the L-Theanine + Caffeine duo is a more natural focus-enhancing combo. However, something tells me that that intended audience of this supplement doesn’t mind caffeine in their nootropics. In which case, I’m fine with it as well. Considering the identity of EVLUTION supplements, this stack seems intentionally designed to deliver the benefits it does: Brain chemicals & brainpower for the bros.
Bro… I can dig it. Memory, mood, & energy are the primary benefits of this focus enhancer that seems to reliably deliver these effects quick & efficiently. Aside from Choline Bitartrate, FocusMode provides top-notch nootropics & ingredients, beginning with the bio-active N-Acetyl L-Tyrosine. Bro formulas have a bad habit of hiding their ingredients under proprietary blends. 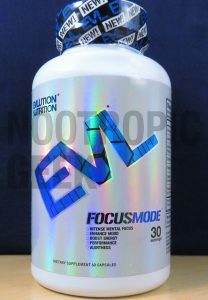 EVLUTION Nutrition are one of my favorites for their sound supplement ethics. Choline Bitartrate is a waste of space that could have been spent on more Alpha-GPC (or better yet: Citicoline). The shiny blue is cool on the label, but not on the pills. The “Other Ingredients” could be reduced to something more clean & green. Not that FocusMode necessarily needs it, but L-Theanine would complement this formula nicely. Consider investing in extra L-Theanine with this one. The pictographs above very nearly detail my exact daily college routine. FocusMode seems primarily geared to college-aged workers & students, yet it’s benefits extend to anyone who practices these behaviors. FocusMode can be bought directly through EVLUTION Nutrition’s website or on BodyBuilding.com (EVL products are generally cheaper on the latter option). If caffeine works, FocusMode works. Thankfully, FocusMode isn’t just caffeine & stimulation, as it does provide bona fide nootropic additions, which also work. The heavy supply of quality N-Acetyl L-Tyrosine is a major plus in this formula. College finals, exams, relationships, finances, etc., etc. can be stressful, and stress burns L-Tyrosine, reducing your focus. FocusMode replenishes focus by replenishing L-Tyrosine, while also sustaining other important cognitive functions related to work, study, & play. To put FocusMode in the context of the Bigger Picture: Coffee supplies caffeine but doesn’t reduce stress. FocusMode supplies caffeine and reduces stress. Plus it’s relatively cheaper, saving you money in the long-run. Students: Kick the coffee and opt for FocusMode instead. Also, eat your damn vegetables, dammit. I am just now starting to learn about Nootropics. Concerning Guarana, how does it compare to Caffeine? What would 340mg of Guarana compare to in Caffeine? From what I’ve read, the average guarana seed contains 47mg caffeine per 1,000mg guarana. So, 340 mg guarana should average to around 15.98mg caffeine, which isn’t much caffeine. (An 8oz cup of coffee contains about 95mg caffeine.) Of course, guarana extract is different and may contain a much larger amount of caffeine — although, typically, guarana extract supplements indicate how much caffeine is supplied. I noticed they’ve changed their ingredients, and levels of them. Would you be interested in doing a review of the new formulation? I’d love to see what you’d have to say about the newer version. Hey, how do you think I would get this product in Australia? And if not this one, a possible alternative?